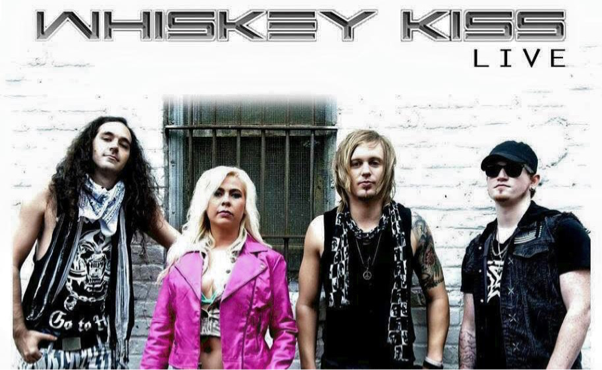 Whiskey Kiss is comprised of 4 energetic rockers from Hattiesburg, Mississippi. Front lady Elise Thornton has been in groups such as Shades of Green, The Glitter Boys, and has played with singer songwriter Karen Waldrop. John Firth on bass has played with the very popular Glitter Boys from Hattiesburg, MS. Sharing the stage with several big name acts such as Motley Crüe, Skid Row, The Darkness, and Rob Zombie. The band received a record deal from Retrospect Records and recorded an album in Las Vegas. Nicholas Kyle Everette, otherwise known as Niko, is best known for being the drummer for Charlee Sheen Overdose, The Boom Chicka Booms, TBird Mac, and The Drive by Junkies. From Hattiesburg, MS, he has opened for Cowboy Mouth, Saliva, Luke Bryan, Lynyrd Skynyrd and The Soggy Bottom Boys. Sam Donald on lead guitar has come from several southeast touring bands such as Waiting for Brantley and Together Tomorrow. Sam has opened for acts such as Theory of a Dead Man, Saliva, Pop Evil, Maroon 5, Neon Trees, PapaRoach and Hoobastank.